Strawberry season this year went by really fast... almost too fast! Up in Wisconsin, the season started late and pretty much ended this past holiday weekend. Sadly, I didn't get a chance to make it. The day we planned on going was rained out. I guess we better get in early next year! Thankfully strawberries were on sale so I still got a chance to play with my favorite berries. 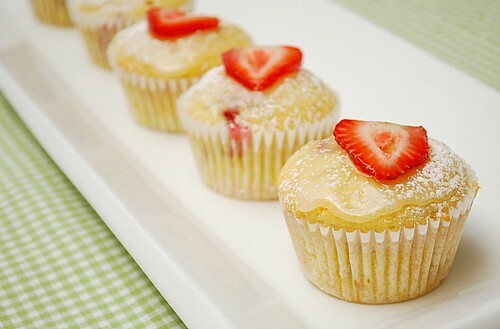 With some of the berries, I made these Glazed Lemon Strawberry Muffins as delicious start to the day. 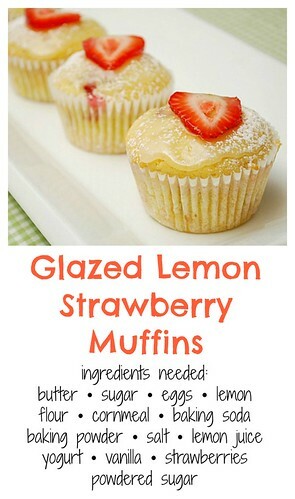 A lemony muffin batter with a hint of cornmeal is dotted with fresh chopped strawberries before baking, then topped with a sweet lemon glaze. What struck me about the recipe was the use of cornmeal. The addition was a nice surprise that really lifted the lemon flavors and complimented the strawberries. Who knew?! This recipe would work well with blueberries as well, since lemon pairs up nicely with them. I just may try this out soon to highlight blueberry season! The glaze was the slight adaptation I made to the original recipe. Because cornmeal has a tendency to result in a dry muffin, I topped them with a simple lemon glaze for that extra layer of texture to offset any dryness. Fortunately, the muffins weren't dry at all so the glaze was just another sweet touch it needed! Preheat the oven to 350 degrees. Grease a muffin tin and line with paper liners. Combine the flour, cornmeal, baking soda and powder, and salt in a medium bowl. In a large bowl, use a mixer to whip the butter for 5 minutes until it is light and fluffy. Add the sugar and cream for another 2 minutes. With mixer on low, add the eggs one at a time, and then the lemon zest. In a small bowl, mix together the lemon juice, yogurt, and vanilla. With mixer on low slowly pour in the liquid, and then gradually add the flour, mixing just until combined. Finally, use a spoon to fold in the sliced strawberries. Spoon the batter into the muffin tin. Bake for 20 minutes, or until a toothpick inserted in the center comes out with just a few crumbs. Cool for 45 minutes. Meanwhile, prepare glaze by combining powdered sugar and lemon juice. Once the muffins have cooled, top with glaze. Garnish with slices of strawberries and dust with powdered sugar before serving. These look delicious! These would be the perfect summer breakfast. Yum! These look wonderful. I love the combo of lemon and strawberries! Those muffins would be such a lovely way to start the day! I can imagine that blueberry would be just as wonderful! These are beautiful - I'm going to make them for my company bake sale, as I think the presentation will make them irresistable! Love it! Nice job. I'll post about them and will link back to you. Thanks!